Happy Thanksgiving! Celebrating holidays far from home is one of the hardest parts of expat life, but this year I am so thankful for friends who are like family and for the opportunity to participate in three separate Thanksgiving celebrations over the next few days. I also wanted to say that I am humbled and thankful for the kindness many of you have shown over the past few weeks here in the blogosphere. You have inspired me. Every Thanksgiving for the past few years I’ve shared this passage from Andre Dubus’ essay “A Country Road Song.” It is one of the most beautiful and moving pieces I’ve ever read. At the age of 49, Dubus suffered a devastating injury when he stopped on the side of the road to assist with a fatal automobile accident. While pulling the survivor out of the wreckage, he was hit by another car. He was injured so badly that he eventually lost one of his legs and was paralyzed in the other. Dubus wrote about the consequences of his accident in many of his essays, but this particular one is about his memories of running. I cry every time I read it because it overwhelms me that a man could feel and express this kind of intense gratitude in the face of such incredible and seemingly senseless loss. If you have a chance, you should read the entire essay because it is so much better than just this excerpt. I share this again today because it has changed me and because I hope it might also be meaningful to you. Wow! That reached me, thanks for sharing 🙂 Happy Thanksgiving! You’re welcome. 🙂 Happy Thanksgiving to you too! What a great read – gratitude and hope truly inspire. 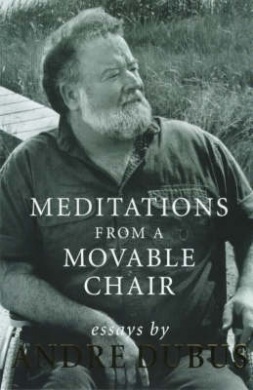 I love the flow of his writing and how he relates with gratitude the loss of his leg as opposed to bitterness. Attitude really is so important. Thanks for sharing this message. One of my favorite things about blogosphere is being connected with others, their thoughts, ideas and experiences. Thank you for sharing. I agree. Some of the best things I’ve read, people I’ve met, and most meaningful new ideas I’ve come across have been from other bloggers sharing the things that matter to them. I’m so glad you enjoyed this. Really love your blog and posts! You got a new follower! Thanks, Steve! I really appreciate it! I’m happy to check out your blog. It seems like you have no shortage of ideas for posting, which is really important when you first start out. Sometimes you start with just one post in mind and then get stuck. I think it’s great that you have so many interests and so many things to write about! Sometimes I feel a little stuck since I started to blog more seriously about faith and spirituality and growing up that more laid-back posts don’t seem to fit as well here anymore. That’s one of the reasons I like doing my monthly What I’m Into posts – they give me a chance to just talk about regular life things like movies and books and TV shows and recieps. 🙂 Keep up the good work! Thank you! Yes, actually my blog started out just as a food blog. Then I had a separate movie review and music review blog. So a friend a mine told me to combine it all. When I get enough ideas, then I added another section. So that’s how I started. I was also going to add a section that’s what I believe (not necessarily all faith) or struggles of life. I haven’t started that section since it’s always hard to think of the first thing to discuss. My audience is very broad so I want to take it easy and slowly tell people who I am. So I got a couple of ideas!